Alncroft in Longhoughton sleeps 6 people. 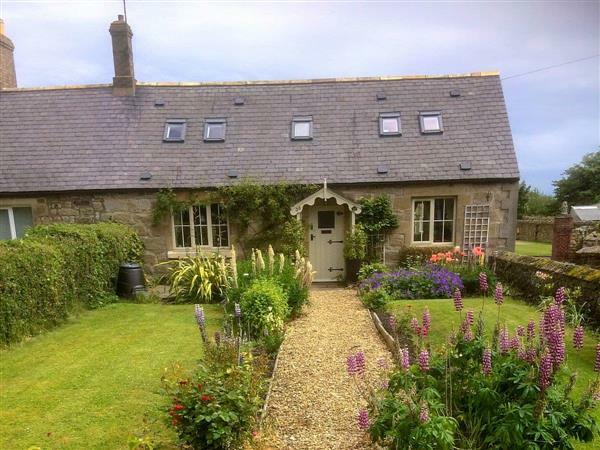 This charming stone-built, period holiday cottage dates back to 1840s situated in the heart of the village, midway between Craster and Alnwick. In an Area of Outstanding Natural Beauty it is perfectly located for exploring this unspoilt county and set on a Heritage Coastal route with some of the finest beaches in Britain. Within 1 mile from a secluded sandy bay and coastal walks. Nearby is the village post office. Alnwick, 4 miles, with the castle used as ‘Hogwarts’ in the Harry Potter films. Bottle of wine on arrival. Shop and pub 200 yards, restaurant 2 miles. Ground floor: Living/dining room with beams. Kitchen. 1 double bedroom. Bathroom with shower over roll-top bath and toilet. First floor: 2 bedrooms: 1 double, 1 twin, both with sloping, beamed ceilings and wooden floors. Shower room with toilet. Electric woodburner in living room included. Gas central heating, gas, electric and bed linen included. Travel cot. High-chair. Three Freeview TVs. DVD. Gas hob. Electric oven. Microwave. Washing machine. Dish washer. Fridge/Freezer. Large enclosed front garden and patio. Rear courtyard with patio and furniture. Portable Bar-be-que. Parking (2 cars). Cycle store. No smoking. Pets free of charge. Holidays at Alncroft run from Saturday to Saturday. For a better idea of where Alncroft is, you can see Alncroft on the map below. Alncroft is in Northumberland; should you be on the lookout for a special offer, you can find all the special offers in Northumberland. It's always worth checking to see what is on offer at the moment. Do you want to holiday near Alncroft (28486), you can see other cottages within 25 miles of Alncroft; have a look to find your perfect holiday location.